If you have been following this build you know I've stated more than once that I'm cheap. Not that I want to be, but this build is on a strict budget so every penny counts. Under normal circumstances I would take the body down to the blaster, or have the dustless blaster come to the house and strip the body. That would be the best scenario, however for that service you're looking at several hundred dollars out of pocket. So.... instead of paying $$$ I'm going to invest my time and about $60 in MAP gas and I'll strip everything myself, starting with the undercoating. Anyone familiar with this era of Mopars knows they used a tar based undercoating. Fine for the time but assembly lines being what they were there wasn't much time to spend on each car making sure things were coated completely. So, needless to say some sections had the coating 1/4" thick and other areas were left uncoated. So, how do you remove this stuff? With a torch and a putty knife. Here is the body mounted on the rotisserie ready to be stripped. As you can see, the undercoating is tan. Let me say this.... this job takes time. This is how the underside looked after 24 hours of work. It took that long to do the front and rear seat floors. Here is a good look at the trunk area. Its very solid, just one small 1"x2" patch needed where the trailer hitch allowed mud to collect. 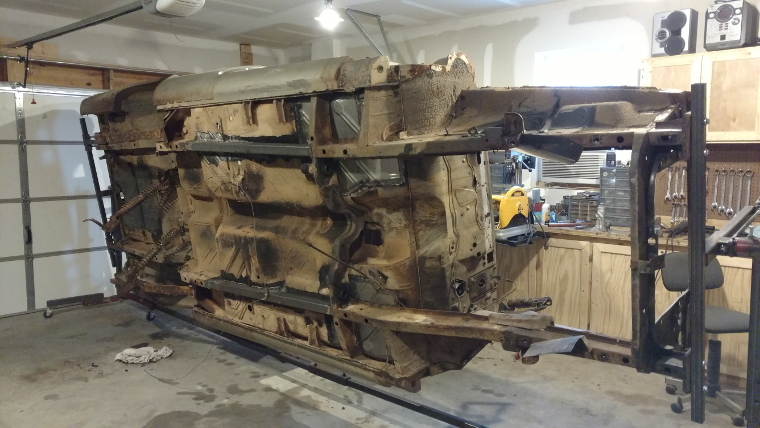 After 53 hours of painstaking work, the underside of the body is finally stripped. You will notice I drilled three drain holes in the subframe connectors to allow any moisture that may collect to evaporate. The last thing you want is for these to rust from the inside out. Some of you I'm sure will say that for a driver removing the undercoating is just a waste of time. However, the undercoating often hides problems and here are a few examples. First, and most serious is this section of the right rear wheel well. Typical area for this kind of damage and it will be repaired with a metal patch made from left over metal from the floor patches. The left rear had no such problem because it was well covered with undercoating, but one spot that wasn't covered well did have a problem. This is the right rear spring front bracket. Upon close inspection I noticed it had broken a weld and was misaligned. I'm not sure what effect being misaligned would have on the action of the spring, but I'm sure it didn't do the rubber bushing any good. Nothing a 5 lb. sledge and a little welding repair can't fix. Now its just as good (and aligned) as new. One other problem that was obvious from the beginning was this... a missing emergency brake bracket. You can see where the bracket (circled) and the space where it is missing on the passenger's side floor in this pic. Since finding one of these will be nearly impossible, I'll spend a little time and make one. The next job was to dress the welds. I'm not a professional welder, and I don't own a TIG welder so most of my welds need to be ground to look presentable. My wife says I'm too picky and maybe I am, but I just like my welding to look as professional as possible. One of the things I like to do is seal any welds in the floor from both sides. Once the welds are dressed on the inside they will get a coat of seam sealer, however underneath I like to add some JB Weld to fill any pits in the welds just as an extra layer of protection. If you're not familiar with JB Weld, its a very tough metal reinforced epoxy that will outlast the car. Here's one of the welds that has been coated. It doesn't need much, just enough to fill any pits or divots. Its not easy to see because its gray in color. The heavier non sheet metal welds don't need this extra protection. This is the rear shock mounting crossmember. It is in very good shape but its one of the areas a lot of people don't check. Rusted or damages areas in this crossmember can cause serious problems if not corrected. In my case (I'm cheap) instead of buying a new set of rear springs for $225, I'll be using a pair of "old school" air shocks to help the weak 52 year old rear springs out a bit. One of the things I'll be doing will be to reinforce this crossmember so it will be able to withstand the extra stress. Using air shocks puts a lot of stress on the upper shock mounts so a little reinforcement in this area will insure there will be no failures. Here is the pile of undercoating I've removed so far. The ruler is there for scale. I still have the front inner fenders to do which will add to this pile and when I'm done I'll weigh this just to see how many pounds of undercoating this car actually had. 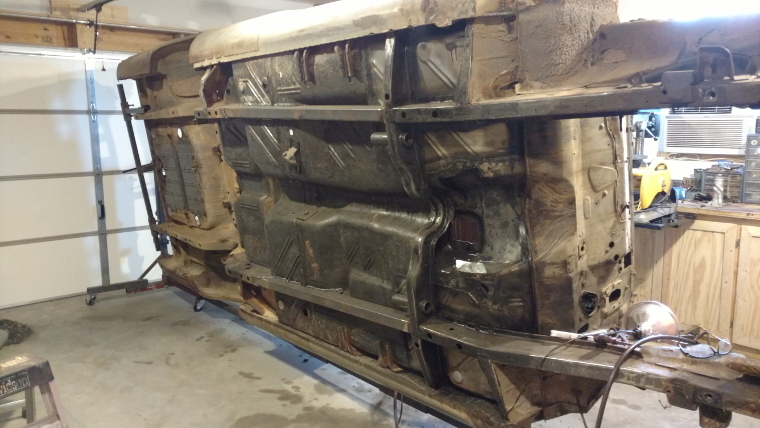 Also, in case you're wondering I'll be coating the underside with truck bed liner once all the repair work is done. That's it for this month. I'll be starting some of the metal patching next.